During early 1645, in the Wars of the Covenant, The Marquis of Montrose and his army had wintered-down at Inveraray, which had been taken from the Campbells. Montrose's scouts determined that the Covenant armies were closing in on them, so they pulled out, heading to Loch Ness-side, near Kilcumin. While facing new threats, namely the Earl of Seaforth and his 5,000 men based at Inverness, a messenger (some records and stories indicate that this information may have been provided by Cameron Scouts) informed Montrose that about 3,000 Campbells, in addition to some Lowland levies, had arrived at Inverlochy (on the fringe of present day Fort William). These men were being sent out on raiding parties to burn the Cameron, Stewart and Macdonald lands nearby. At this point in time, or perhaps slightly beforehand, three hundred Cameron men were sent to fight under Montrose by Allan Cameron, XVI Captain and Chief of Clan Cameron. With Campbell troops coming at them from the south, and Seaforths from the north, Montrose and his men took to the hills; the Covenanters found only an empty glen when they met up with one another. Reasoning that they should attack the strongest enemy first, Montrose was led by Cameron scouts, by little known paths (the actual path taken is still debated) to Inverlochy. What is known is that from the Roy Bridge area they forded the river Spean near Corriechoille and traversed a secret way via the old townships of Kilchonate and Leanachan and were at the foot of Ben Nevis' "shoulder" of Meall an t-Suidhe before dark. 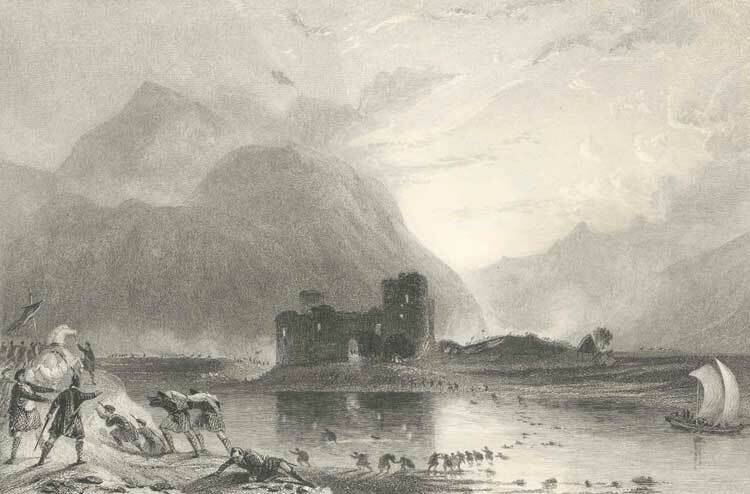 They observed the tower of the ancient castle of Inverlochy and many Campbells moving around their camp. The Campbells saw them, and assumed that they were only raiders, or foraging parties. Montrose and his army laid out all night in freezing temperatures and at the break of dawn the "stupefied" Campbells, including their chief Argyll, were awakened by the pipes of Montrose's assembled clans charging down upon them. Even though they were outnumbered by approximately 1,000 troops and were facing some cannon fire, the army of Montrose broke the Lowland soldiers on the wings, forcing them to flee the field. The Campbells in the center of the line held firm, but soon were cut into groups and eventually fled. To state that little quarter was given is an understatement. One account, by poet Iain Lom, recorded the action from his first-hand vantage point at the field of battle. Allan himself did not partake in the battle, being nearly ninety years of age at the time. It is said that he looked on from a distance and immediately following the battle congratulated Montrose on his great victory, entertaining him for four days in Lochaber. It was indeed a bold move by Allan, especially since his eldest grandson and heir was in the custody of Argyll.